Product prices and availability are accurate as of 2019-04-21 15:45:10 UTC and are subject to change. Any price and availability information displayed on http://www.amazon.com/ at the time of purchase will apply to the purchase of this product. 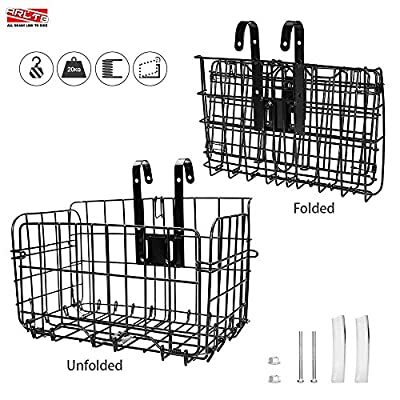 The basket for bikes not only can carry many goods such bags, grocery, books and flowers, but also could be folded to a smaller size for convenient storage while not needed. Just three simple steps need to install the basket to your bikes. First, lift the buckle at the top to unfold the basket. Second, put the basket hooks into the plastic tubes. Finally, put the basket onto your bike handlebar and tighten the two bolts to fix the basket. The basket is only suitable for some kinds of mountain bikes and folding bikes. The handlebar diameter should be smaller than the bike basket width 4.5cm. In order to prevent the bottom of the basket touch the bike tire, please make sure the distance between the handlebar and the bicycle tire is higher than 12 inch (30cm).